Winter bicycle parade in Moscow, Jan. 8, 2017. 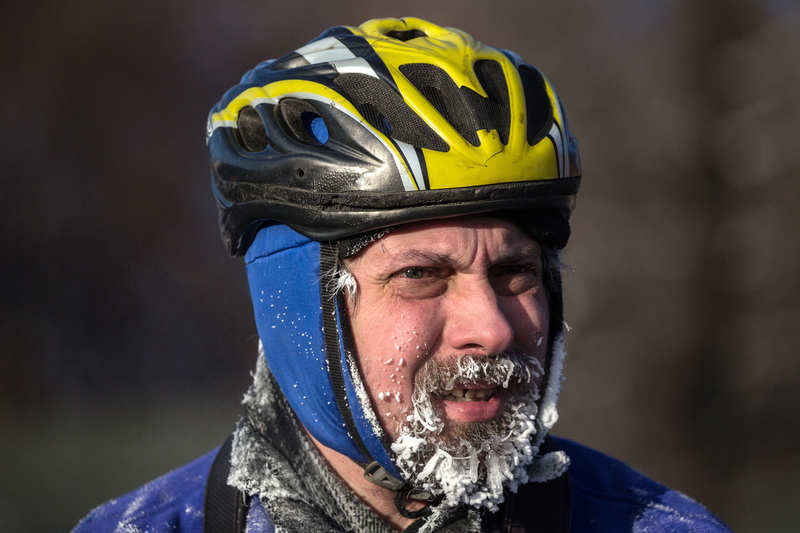 More than 500 people participated in the second winter bicycle parade in Moscow, though the air temperature was minus 28C (-18.4F), the city’s transport department said on Jan. 8. "Despite the "orange" alert in Moscow due to the strong frost, the organizers decided not to cancel the event, which featured more than 500 participants," the officials said. All the bicyclists were recommended to be accurate and to observe safety rules in the anomalously low temperatures, which Moscow experiences since the Orthodox Christmas (celebrated on Jan. 7). "Emergency services were at alert in the beginning and at the end of the route," the officials said. "All the people had chosen appropriate clothing, and nobody asked for medical assistance." The event is not a sport race: residents and visitors of all ages and of any physical training were invited to take part in it. The average speed of cyclists during the parade did not exceed 14-15 km/hour. In 2016, the Russian capital held four bicycle parades. In January of 2016, the first winter bicycle parade gathered more than 3,000 people despite cold weather.